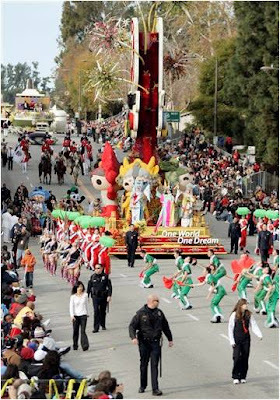 While the Tournament of Roses is busy preparing for the Pasadena Rose Parade on Jan. 1, 2009, it is interesting to revisit a controversy over a Beijing Olympic float for the 2008 parade for at least three reasons: (1) the controversy, largely provoked by FLG practitioners and other human rights groups, attracted huge media attention and the Pasadena city government and its human relations commission held several meetings to consider its position; (2) some analogies can be drawn between the controversy and the protests against the overseas leg of the Beijing Olympic torch relay; (3) the controversy also indicates the challenges that Beijing faces in general when it attempts to engage the American public in specific and the Western publics in general. Sue Zhang, a prominent Chinese American community leader in Los Angeles became interested in the idea of a Chinese rose float and thus contacted officials in Beijing and talked with the mayor in Pasadena. She was connected with Avery Dennison through the Pasadena Sister Cities Committee and thus became an organizer of a Beijing Olympic-themed float. Ten Chinese Americans became sponsors, with each contributing 20,000 dollars and Avery Dennison contributed 200,000 dollars. The ten Chinese Americans, most belonging to Beijing Association with Sue Zhang as the chair, then become a newly named organization called the Roundtable of Chinese American Associations in Southern California, On April 15, 2007, Sue Zhang announced at a press conference that a Beijing Olympic-themed Rose Float would appear in the 2008 Pasadena Rose Parade. The announcement was greatly applauded by the conference participants, most of whom were overseas Chinese community leaders and participants in Los Angeles. 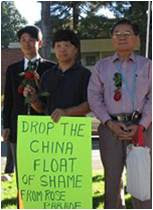 A Chinese cultural consul in Los Angeles stated that “having the float was a one-hundred year dream fulfilled” and it was “a proud achievement of all Chinese throughout the world.” Many participants at the conference claimed that the float symbolized how Chinese Americans had overcome ideological differences for the first time to accomplish a common goal. At the beginning, the Olympic float was meant to be part of an overseas marketing plan for the Beijing Olympics. However, after the entry was announced officially, various human rights groups protested against it. Key protest groups include the Caltech FLG Club, Reporters Without Borders, the Visual Arts Guild, Amnesty International, the Conscience Foundation, the China Ministries international, the LA Friends of Tibet, Human Rights Watch, Justice for American Victims in China, New York Coalition for Darfur and the Burma human rights groups. FLG practitioners voiced their concerns first at a city council meeting on June 25, 2006 and were key players in the protest. Human rights activists made a concerted effort in lobbying the city council members of Pasadena and voiced their concerns repeatedly at routine city council meetings. They spoke about their own suffering or suffering of their relatives or friends in China. Issues such as torturing, the imprisonment of FLG practitioners, journalists and Catholic ministers, police corruption and lack of media freedom were constantly voiced during the public comments sessions on the following days: June 25, July 16, July 23, July 30, Oct. 1, Oct. 8, Oct. 15, Oct. 22, Nov. 5, Nov. 19, Dec. 3, Dec. 10 and Dec. 17. The controversy was covered extensively by media such as Pasadena Star News, Pasadena Weekly, the LA Times, KPCC, the Associated Press, Voice of America, KTLA Channel 5, KABC Channel 7 and Chinese-language media. Pasadena Weekly also published letters from residents, most condemning China’s human rights records and viewing the US human rights policies toward China as too soft. Kenneth Todd Ruiz from Pasadena Star News and Joe Piasecki from Pasadena Weekly were staunch supporters for human rights activists. For the float supporters, one of the most important strategy is to keep the float apolitical by delinking the Beijing Olympics in general and the float in specific from human rights issues in China. It must be pointed out that all city council members and officials, and officials from the Tournament of Roses, regardless of whether they supported the float, all expressed sympathy to human rights activists, condemnation of human rights abuses, and support for human rights improvement. The support can be seen in ongoing conversations between the city government of Pasadena and the human rights coalition about a possible pre-parade human rights torch relay and other arrangements. Even though the arrangement failed for various reasons, with each side telling a different story, sincere efforts to accommodate human rights activists indicate that human rights issues were of significant importance to officials in Pasadena. The second point that led to disagreement was whether human rights should be a leading concern when the US deals with China. While some viewed as more desirable to have good relationship and share values, but for others, China is about human rights abuses and anything related to China is opportunity to reach out. It was really about engaging China or shaming China. For supporters of the float, the shame strategy was ineffective and they argued for a middle ground that let the float in and simultaneously showed concern to human rights issues. But for protesters, losing face for the Communist Government was an important strategy to get their message out. While supporters generally viewed that people should be patient with the government and that changes were not made overnight, protesters were extremely suspicious of the government and felt that some Chinese organizations were front organizations of the government. The third point of disagreement was whether Pasadena had the jurisdiction and moral authority to address human rights issues in China. For many, it was the federal government that should address China’s human rights abuses and the role of local government is to take care of local issues, but for protesters and their supporters, Pasadena should express its stand in China’s human rights abuses. 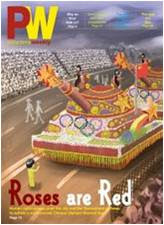 The Beijing Olympic float is complicated because it is a local float with international meanings. Pasadena was especially reluctant to address this issue for being afraid of opening up possibilities for other human rights groups to request Pasadena to deal with similar issues. Because many overseas Chinese were proud of the Beijing Olympics, Pasadena did not want to offend the large Chinese community in Los Angeles. Understandably, float supporters expressed displeasure of the float being hijacked and they questioned why they did not pick up the Huntington Library where there is a Chinese Garden, or GE or even Wal-Mart that has large businesses in China. Protesters focused on the float because of the tremendous publicity the tournament of roses brings. The 119-year-old yearly parade is one of the most viewed events in the US. The 2008 parade was broadcast live by nine networks/stations and amounted to 14.7 U.S. national Nielsen rating points, or approximately 15.96 million households, with a total audience of approximately 40 million in the U.S. 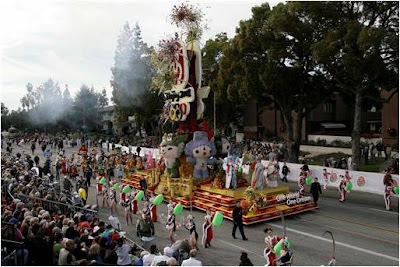 In addition, the Rose Parade was televised in 215 international territories. The controversy also indicates that relatively small number of committed activists can be very powerful in setting the agenda and influencing international issues. While during the Olympic torch relay, Tibetans and their supporters were most active in posting Beijing, but FLG practitioners were active protesters against the Olympic float. Generally speaking, China’s dim international images, particularly the perception of China’s human rights records, can pose tremendous challenges for China when it engages with the international community. In my conversation with float supporters at the Pasadena city government and the China Sister Cities Committee about whether they would have done things differently if they had known the controversy, all of them expressed a hesitation and stated that they would think twice before any involvement. One idea about human rights activists seeking overseas support. On the one hand, seeking overseas support can publicize their causes and give the Chinese regime more international pressure, but on the other hand, it gives the Chinese government more legitimacy to crack them down and it might further alienate many Chinese who do not necessarily support the Chinese government and nevertheless are concerned with China’s international images. Indeed, the overwhelming support for the overseas leg of the Beijing Olympic torch relay in April-May 2008 indicates that Chinese nationals or overseas Chinese can rally around the government when an idealized image of China is threatened. To a large extent, many Chinese nationals and overseas Chinese are still very sensitive to the issue of national dignity, largely because the national narrative of China’s one-hundred-year humiliation (bainian quru shi) is still resonant with many Chinese. Thus, the backing from any foreign government can backfire by provoking the image of foreign colonizers suppressing the Chinese people again. Good article and I have to concur on your ideas in the last paragraph. Wonder when the FLG people would realize how disliked they have become to the overseas Chinese community at large! Ya, I agree with aya above. While most of the us are concerned w/ the human rights issues and would like to see a more democratic China, the FLG seem hell-bent to alienate every rational oversea Chinese/ person of Chinese heritage. Sometimes I wonder what it is that they really want: a China that is totally isolated from the rest of the international community? As to the other protesting organizations, I wonder where were they 25 to 35 years ago when the situation was much worse than now. China should ignore the cacophony made by these low lives who masquerade as 'human rights activists'. China needs to redouble its efforts to develop its economy. Only when it truly achieves the status of a superpower can it shut up the pesky detractors. By the way, if these human rights people are truly passionate about their cause, why didn't they go protest against the greatest atrocity of the century -- the US-led invasion of Iraq and the ongoing murder of the innocent Iraqi people. Demand The Human Rights is not enough, we must exercise them every day. I disagree with the article in part. This is of the not-reported central role of Reporters Without Borders played in this organized, international media campaign. 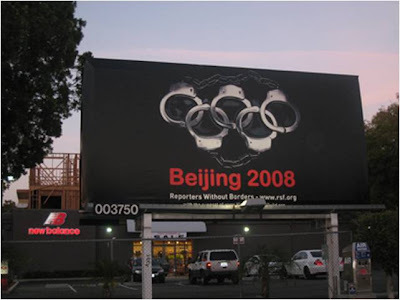 The campaign was organized to expose human rights abuses in China using the Beijing Olympics as a media vehicle. Since China Beat writes about the Media, this is very relevant to them. that they (Reporters Without Borders) were central players.